Ok, beta testers... I have run this DEMO and tested over 100 Billion data Bits with no Transmission Errors over the distance of 10 feet from one Propeller to another Propeller. Here is a beta release before I place it in the object exchange. ...· Enjoy!! Wow... This will see some action on my desk soon! I'm picturing two props linked by their propplug port with a slightly modified cdrom audio cable... heh..
Just getting started with Propeller? One question: did you have the two props running off the same clock, or were they using independent clocks? If they're using independent clocks, drift may become an issue with this circuit. Assuming 1% drift, you might be out of phase by 34 ns by the time you reach the stop bit. That will be more than the 25 ns margin you have from the starting edge (actually less, since there's a sampling setup time involved). If it's possible to skew the sampling by one cycle so you're in the middle of the bit, that would give you more margin. Very cool Beau, that is actually 10mbps raw data rate. Hmmm... two waitpne's in a row should take 10 cycles, positioning the "sampling point" right in the middle of 100ns bit cells... smart! I even considered a faster version, where a long would be compiled into a series of set/clear tx bit, that way a 20mbps data rate can be achieved for transmission; and a wasteful sampling of one bit to cog long would also allow 20mbps reception. David, I would not worry - even if both crystals/oscillators had 100ppm error, worst case error would be 200/5000000 which means you'd have to have 25,000 consecutive bits before you drifted one bit cell worth. Here is a beta release before I place it in the object exchange. ... Enjoy!! I am trying to figure out the practical implications of this data rate... for instance does 8.42 Mega baud mean that I need 4 lines connecting two Props to transfer raw data at NTSC rates? The Props are running off of independent clocks. ...And sampling does happen in the middle of the "instruction" bit (see below).· At 10 feet of ribbon cable the signal did not appear to show any significant "edge-rounding" due to capacitive/resistive effects of the cable. Within roughly 10nS, any edge distortion had stabilized to one rail or the other. I consider an unshielded, 10 foot connection to be excessive, and your signal will only improve with closer, shielded connections. The tolerance of the 5MHz crystal on the Propeller is +/- 30 PPM which translates to +/-480 PPM after the X16 PLL. Even at 80MHz, an error of +/-38,400 (<-- 480 PPM X 80 = 38,400) pulses is better than 0.001% error. If each LONG transmission takes 3800nS that's 304 Clocks (<-- 3800nS / 12.5nS = 304 Clocks) ... multiplied by a 0.001% error, that's 0.304 or approximately 1/3rd of a single clock pulse. "Hmmm... two waitpne's in a row should take 10 cycles, positioning the "sampling point" right in the middle of 100ns bit cells... smart!" You get the idea, but it's not in the center of the 100nS bit cells.... break up the 100nS Bit Cells so that 50nS samples the bit, while 50nS Shifts and rotates the value into the Buffer. In the first 50nS, the sampling is in the middle because of the 2 cycle offset (2 x 12.5nS = 25nS) of the 10 cycles required from the·waitpne and waitpeq instructions. 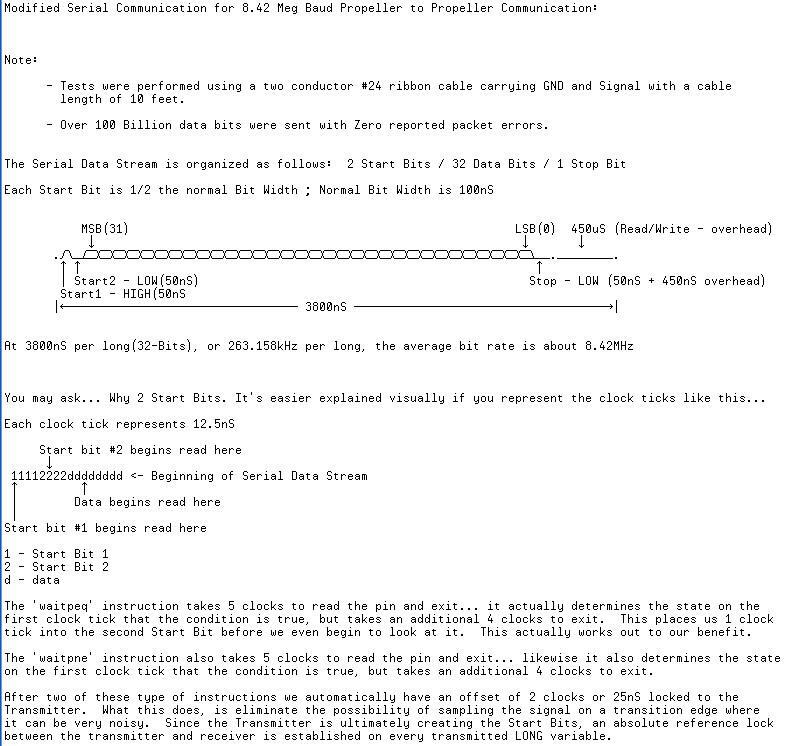 "I even considered a faster version, where a long would be compiled into a series of set/clear tx bit, that way a 20mbps data rate can be achieved for transmission"
The 8.42M baud is not a continuous data stream,· it is sent in·bursts much like standard Serial practices.· I·Suppose that you could use 4 COGS pointing to different memory address ranges for a burst throughput of 33.68 MHz. Just out of curiosity, as I've wanted to ask a few things like this, but what about temperature changes etc, would any external effects change the accuracy? Cos I've·been·thinking about a byte burst data mode, for propgfx too. Ok, so this is an extreme... While one Prop was at room temp, I held a lighter·to the crystal of the other Prop until it was too hot to touch... still no packet errors. Note:· It doesn't account for any temperature variations of the Prop itself though... but if the time base remains stable, then so should the rest as long as the code is·able to run. Oh, another question for you Beau, or anyone in the know for that matter. RDLONG takes 7+ cycles, say 7 for example, eg, it caught it when the hub was ready for it. and a DJNZ back to the RDLONG would add another 4... would that then make the RDLONG hit 7 cycles? or would it be more?
' would this RDLONG take 7 cycles, or would it be different, since the two replacement ones ( mov and xor ) would have taken 8 cycles, and not 7. ? So, what we do now for NTSC... will work later for HD. Either way, you are going to have to get cracking on this, I have already started spending the money. Thanks, Beau! Good to know you've looked into the drifting and whatnot. Tried to get this working last night but, alas, nothing I tried was error free - in-fact I was very lucky if I got only about 25% errors! Prop1: PropStick with 5MHz xtal acts as Tx. I tried Tx/Rx connection using a) 10cm jumper wire, and b) 1.5m Cat5e cable. 1. With no wire connecting Tx - Rx I was seeing error count increment by one approx. every 1sec. 2. With Tx/Rx connected, errors incremented much faster. 3. I tried different waitcnt values (line 86 in Tx), but this only appeared to affect the rate of error incrementing! 4. Tx/Rx connection using Cat5e cable produced faster error increments than the short jumper wire. I'm guessing that the problem's down to the mis-match of xtals? Gave up trying at 02:00 this morning (! ), but will try again with another 10MHz xtal'd Prop' this evening. What would be the best way to add some flow control? Do you have the GND's connected together between the Propellers? Not sure I understand the 2nd point; my Tx Prop has a 5MHz xtal, so setting _clkmode & _xinfreq as above wouldn't be valid, would it? Why you have diferent Buffer sizes on TX/RX ? I'll be sure to try again tonight. The file you posted has 800 instead of 800_000 ... with your TV modification and 512 Packets on the receive side, the minimum number without generating errors seems to be about 520_000. I thought that this was odd also... However, as long as the TX is sending more packets than the RX is receiving you should be ok. The "extra" Packets in this case are simply ignored. Yeah, I _think_ that's just because I didn't save the versions in step (oops! ), but I'm sure I had them in step during testing - I'll try again tonight. As for the _xinfreq & _clkmode; I've used those settings OK on previous object tests, but do you think that might be causing bit sync problems? Probably... I did have a 10MHz·around here somewhere, but I can't find it at the moment. Hmmm, OK; what did you use for _xinfreq & _clkmode? "Hmmm, OK; what did you use for _xinfreq & _clkmode?" The same settings you had... Attached is a modified version of the code you sent for both RX and TX. From the time I started it about an hour ago, it's reached over 2.5 Billion Bits with no Errors. Thanks Beau, I'll give that a try when I get back home in an hour. Turns out that it's the PC to Prop' connection that caused the errors! I discovered that if I touched the DB9 connector everything started working, so I disconnected the PC serial cable and all's fine. Does anyone know why this might be? I'm guessing it's something to do with earthing, but haven't a clue why. Also, I found the minimum waitcnt values were as follows: PS = 512, waitcnt = 520_000; PS = 1024, waitcnt = 735_000. With three different wall-warts, the likely hood of creating a ground loop, shouldn't but might increase... One thing to do would be to check the ground potentials from each supply with a DMM (Digital Multi Meter) without anything connected to see if·there are any noticeable differences.... Ideally, they should all read 0V, but under a typical circumstance, I would expect small voltage variances measuring between the output GND connections. This is still work in progress.· Using only 1 COG for the Transmitter, and 1 COG for the Receiver, 14.5 Mega Baud Communication Packets can be achieved. Packet confirmation.· Also, the demo provides a "real time" visual representation of the Transmitter's I/O state displayed on the·Receiver screen. Ale, doesn't DIRA control the output's so you can only have it affect 1 pin? Nononono, I'm mistaken... the problem is not that DIRA is not unique, it is unique per cog, and does not reflect the other cogs' status. Niether do OUTA, they are all OR'ed together and independent, and they only contain the value written, not all the OR'ed values. Very clever. Understood.